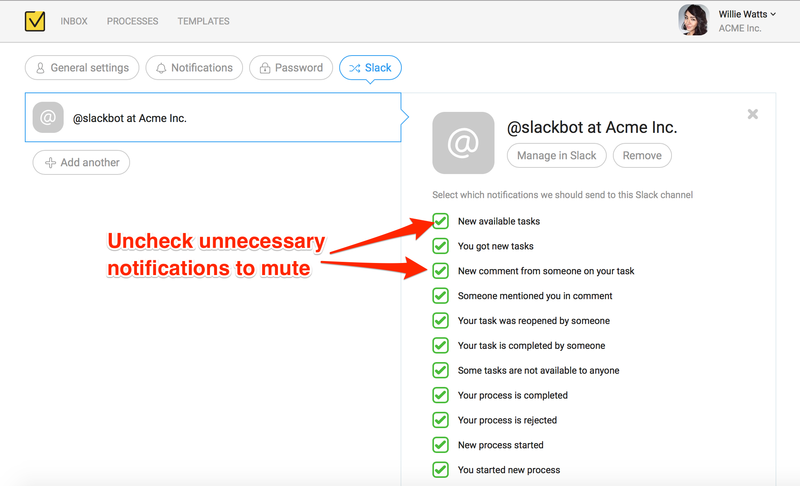 notifications directly to Slack channels instead or in addition to email. 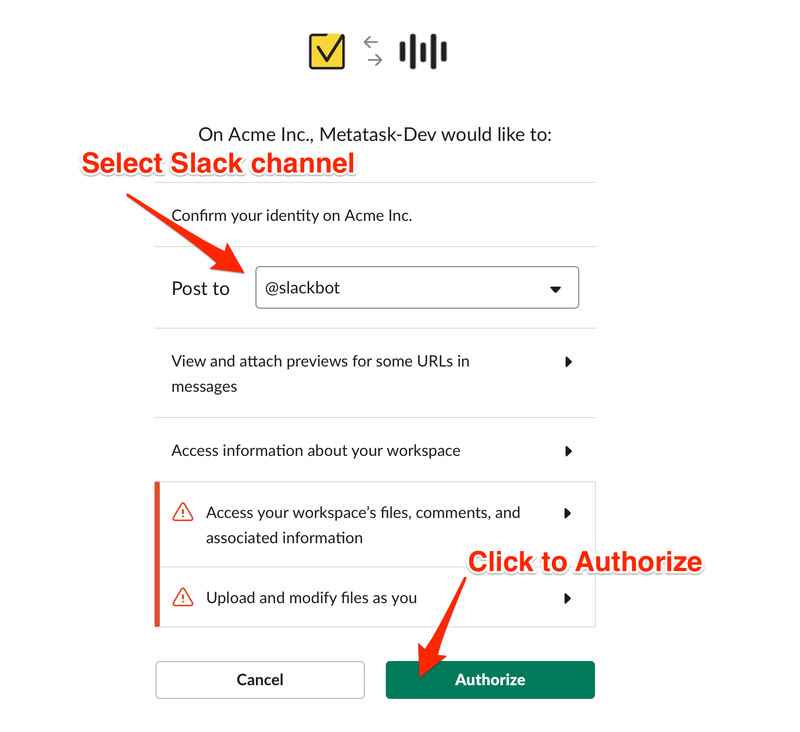 You can connect one or multiple Slack channels and configure specific notifications for each Slack channel. 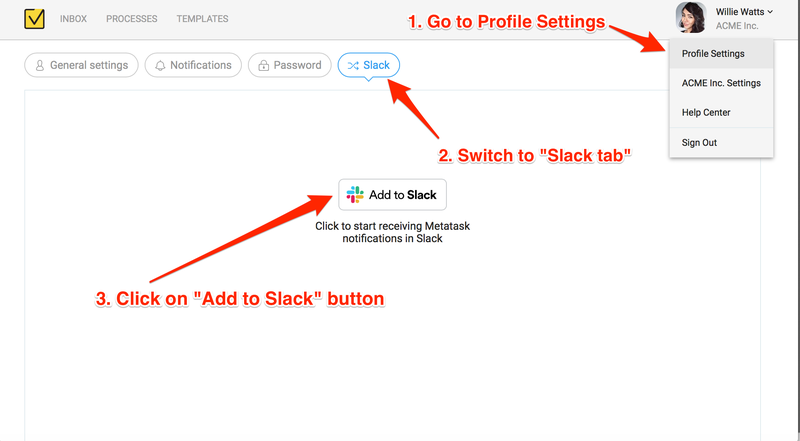 Go to your profile settings page and switch to the "Slack" tab. 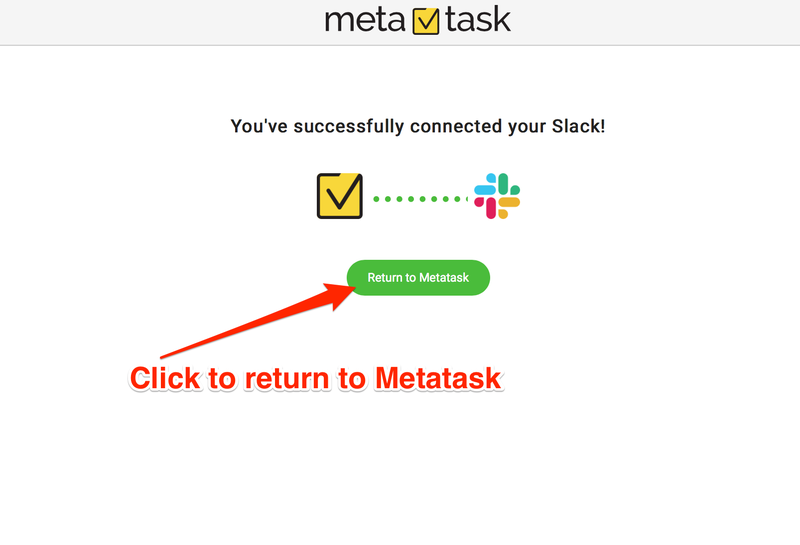 Then click "Add to Slack" button. "New available tasks" - When new task is available to you and can be assigned to self. You can find these tasks in Available tasks list. "You got new tasks" - When new task is assigned to you and you can start working on it. You can find these tasks in "My tasks" list in your Inbox. "New comment from someone on your task" - When someone added a comment in one of your tasks. "Someone mentioned you in comment" - When you were mentioned it task comments. "Your task was reopened by someone" - When you completed the task but someone reopens it. "Your task is completed by someone" - When your task was completed by Process manager. "Some tasks are not available to anyone" - This notification is sent to Process manager, when task is created in your process but cannot be assigned to any user. You can resolve it by manually assigning the task. "Your process is completed" - This notification is sent to "Process Starter" and Process managers when one of your managed processes is successfully completed. "Your process is rejected" - This notification is sent to "Process Starter" and Process managers when one of your managed processes is rejected. "New process started" - This notification is sent to Process managers when someone starts a new process.